The changing international donor landscape and shrinking external resources pose risk to the African continent in sustaining the progress made in the AIDS response. This, coupled with the limited increases in domestic investment in health and HIV, has led to the widening of the resource gap between what is required and what is available. It was to examine the current domestic funding environments and to seek innovative sources of domestic revenue to bridge this gap that the Champions for an AIDS-Free Generation in Africa led a two-day dialogue in Pretoria, South Africa, recently. The high level roundtable dialogue was hosted by HEARD, UNAIDS and the Champions, who are former African Heads of State and other influential African leaders. The Champions for an AIDS-Free Generation was launched in 2008 with a commitment to end AIDS as a public health threat by 2030. Individually and collectively, they provide a unique resource to mobilise political leadership to deliver an AIDS-free generation in Africa. These influential Africans occupy a unique niche from which to generate top level leadership on AIDS. They possess exceptional legitimacy and authority concerning AIDS and development, deriving from unrivalled experience, expertise and integrity as well as enjoying the respect of and access to African Heads of State and Government and top leadership. The SADC Parliamentary Forum and the South African National AIDS Council (SANAC) also participated in the gathering of these influential and independent leaders. The dialogue brought together the Champions, African Ministers of Health, Parliamentarians, Permanent Secretaries, NACs, private sector representatives, CSOs, representatives from the United Nations, AU, development partners and donors. It was an opportunity for the Champions to make the case for the mobilisation of domestic resources before those in attendance. To lay the groundwork for discussions, UNIADS gave a perspective on Africa’s turning point, a historic opportunity to realise the 2030 goal. To this end, HEARD Executive Director Professor Nana Poku spoke about advancing political leadership for domestic investment in sustaining the AIDS response in Africa. 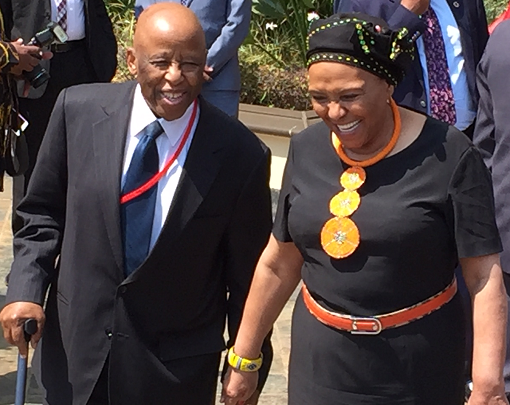 The role of leadership was outlined by the Chairman of the Champions and former President of Botswana, His Excellency Festus Mogae. His Excellency and fellow Champions member, Her Excellency Speciosa Wandira-Kazibwe, the former Vice President of Uganda, chaired the various discussions including on the role of the private sector, equal access to health and HIV services and the strengthening of health systems. To make the goal of an AIDS-free generation a reality, definitive collective action with clearly defined goals and concrete steps was discussed, for countries to engage in for increased commitment to domestic financing to launch a new era of sustainability.